Indiastat is a product of Datanet Pvt. Ltd. launched in 2000. 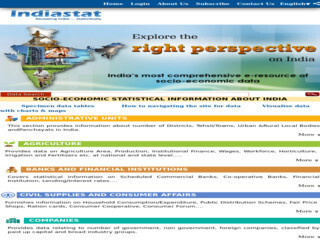 IT is a gateway to comprehensive and authentic socio-economic information related to India. This is the mother site of cluster of 57 websites delivering socio-economic statistical data related to research conducted in and out side India. This is the only source to get statistiscal information about socio-economical problem around India.